This elegant home is situated on a corner lot. It features a charming courtyard and a beautifully landscaped backyard with a fountain and garden shed. The 3 bedroom, 2.5 bath home boasts an open floor plan and approximately 2,447 square feet. The dining room and living room with custom fireplace have hardwood floors, crown moldings and sliding doors leading out to the lush backyard. It is a perfect home for indoor/outdoor entertaining. The remodeled kitchen features granite counter tops, built in subzero refrigerator, wine fridge and island. The kitchen opens to the den ideal for large gatherings. The spacious main floor master suite features a large walk in closet, hardwood floors, fireplace and over looks the back yard. Two additional bedrooms are upstairs with a Jack and Jill bathroom. The attached two car garage offers plenty of storage space. Upgrades completed on the home include Anderson windows and sliding glass doors, wood floors, crown molding, system pavers, custom fireplace, beautiful iron stair railing, newer oven, microwave, built in subzero refrigerator and more...The home is situated in the sought after Sea Bluff Community which is truly resort living at its finest offering tennis courts, pool/spa, gym, clubhouse and walking path with ocean views. 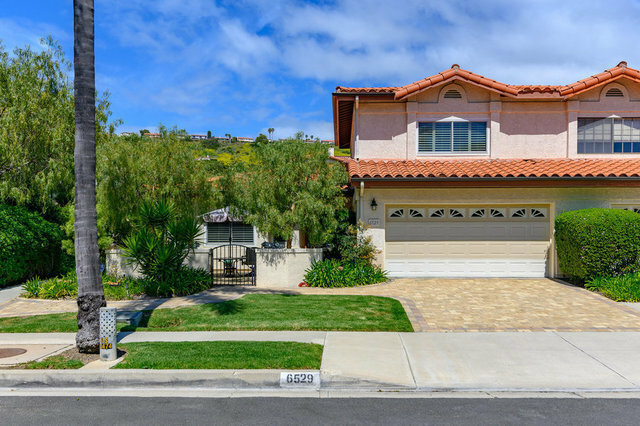 Close to The Terranea ocean front resort with a 9 hole golf course and spectacular walking trails... Don't miss this house!